A Mold-based digital PR agency is celebrating after winning two industry gongs at this year’s Chartered Institute of Public Relations (CIPR) PRide Awards. 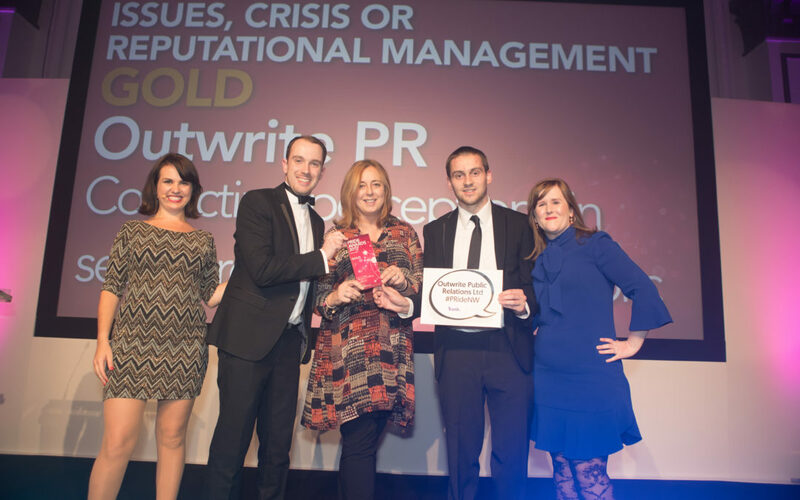 Outwrite PR won gold in the best issues, crisis or reputational management campaign at the CIPR North West awards, and took home silver for best STEM (science, technology engineering and maths) campaign at the CIPR Cymru Wales awards. Organised by the industry’s royally chartered body and entered by some of the UK’s top agencies, the PRide awards are recognised as the most prestigious in the PR industry. In the issues and crisis campaign, judges commented that Outwrite had a clear ability to change the reputation of its client. They also commented that the agency ‘combined solid research plus multi-channel implementation and use of digital’. The North West awards took place in Manchester. And Outwrite’s success continued in Cardiff, as its video-based Facebook and online media campaign to support Jones Bros Civil Engineering UK’s recruitment drive took home a silver award. The creative digital campaign helped boost the number of high quality applications received by the firm for apprenticeships. At the same awards, Outwrite was also shortlisted for best use of digital, and best B2B corporate communications campaigns. In total in 2017, Outwrite has been shortlisted for nine awards, at the UK Social Media Communications Awards, Northern Marketing Awards and CIPR. Managing director Tracy North said: “Our industry has evolved so much in the last few years. We saw the changes coming, ad decided to invest heavily in personnel and training to get ahead of our competitors, and it’s certainly paying off. “It helps that I’ve got a team of creative and committed employees. We all love taking on a new brief that gives us the scope to think beyond normal parameters to devise stand-out campaigns. “It also helps that we are all trained journalists. We can spot sometimes quirky angles that will get people’s attention. We’ve also got the skills to create engaging content that also expertly tells a brand’s story. Outwrite’s digital director Anthony Bullick said: “Winning a CIPR award is a major achievement for any PR agency, so to win two is an outstanding result for Outwrite.